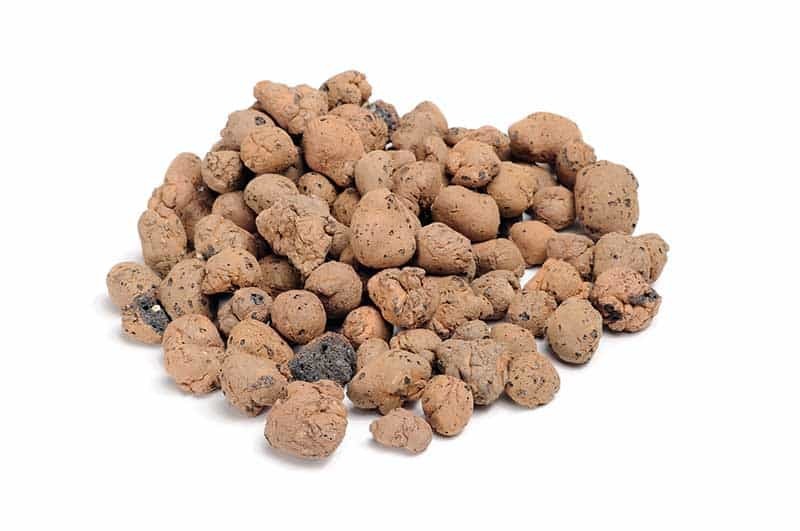 Hydroton grow rocks, or expanded clay pellets, also referred to as leca clay, clay balls, are one of the most helpful and versatile growing media to any traditional and hydroponic grower. They’ve gained popularity over the last ten years for their porous shape. With these pores throughout each ball, the pellets make it easy to support a steady distribution of nutrients, oxygen, and water around the roots of various plants. What is Hydroton / Expanded Clay Pellets? Expanded clay pellets (Hydroton) are made by heating the clay to over 2,000 degrees Fahrenheit. The process is done in a rotary kiln. As the balls heat up, they fill with bubbles and form into small marble-sized units. While the clay can be used on its own for growing plants, it can also be mixed with soil and other growing media. Hydroton is used widely in hydroponics and aquaponics. There are many reasons that you may gravitate towards the use of extended clay pellets for horticulture growing. Water drainage. The biggest appeal seems to be the way that it helps to drain excess water, though they also keep enough nourishment for constant delivery of it to the roots. Sterile. While expanded clay pellets last for a long time, it won’t actually nourish the plant. They have no nutritional value and are primarily meant to use as vessels for the other food provided to your plant. For this reason, they help to keep insects and bacteria away from the plant during growth. pH neutral. This will bring no effect on the current soil used in the garden. You can combine it with any plant solutions and foundation you need for your garden, without worrying its impact. These pellets are an inexpensive method of making nourishment go a long way. Easy for harvest and transplantation. Because hydroton is a form of pellets, it does not stick. You will not face much nuisance when taking the plants/seedlings completely from the grow pots. Costly for large growers. Hydroton is such a very easy-to-use material for hobbyists and small growers, but it is not cost-effective for commercial productions or large-scale growing. Drainage issue. The most discernible advantage of hydroton grow rocks is also its own cons. Because it drains significantly well, this material can dry out very quickly. Not a big concern, but just keep that in mind if your plants do not have a consistent flow of water and nutrients. Dust from the clay. Unless you clean and completely soak these pellets, dust from this material can float. And there're chances it blocks your system drain lines. Without doubt, hydroton is one of the most popular growing media chosen by hydroponic and aquaponic growers. Because it's sterile, lightweight, easy to harvest, and transplant, it can be used in almost any hydroponic system - wicking, deep water culture, ebb & flow, etc. One caution to work with hydroton is that because it does not have a great water holding capacity, it's better that you have a hydroponic system that irrigates/waters regularly. This is really worth thinking when you grow water-craving plants like lettuces using hydroton as the main growing medium. Another approach is to crush the pellets for better drainage. But this comes with a con that the medium can be flown away and block the system in a water-heavy system like the Ebb & Flow. Hydroton can be used alone or mixed with soil in disproportionate amounts. When using the expanded clay pellets in gardening, you need to figure out exactly what your plants need for growth in the first place. If you want the water to drain around the roots to aerate them, leave the pellets whole. You can use Hydroton alone or mix them in with the soil. A 30 - 70 (30% percent of hydroton, and 70% for soil) works great in improving the water-holding capacity of the mixture. Some plants need to retain water, rather than aerate the soil and roots. In that case, you can crush up the clay, mixing it in with the soil to keep plants hydrated for longer as you tend to it. Along with the nutrients that the clay preserves, you also drain the excess moisture to prevent mold and rot. You can get it at most garden, hydroponic stores, or big home and garden centers such as Home Depot, and Lowes. Or the most convenient way is to order online from a variety of sellers and distributors. 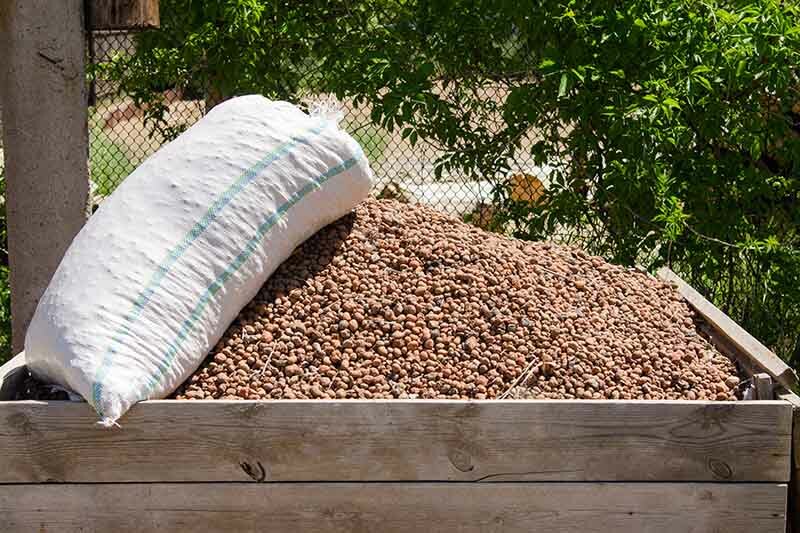 Before putting the expanded clay pellets into a garden, you need to take the time to rinse and soak them, getting rid of any debris or dust that resides in the pores. You can use a bucket of water to moisten the pellets though you may need to rinse again. To infuse them with nutrients, add your preferred growing solution before placing them in the garden or pot. Only use about 25% of what you normally use, since it’s already going to be concentrated while it soaks into the pellets. Some resources suggest that you allow the expanded clay pellets to soak for at least six hours, though soaking for up to 24 hours will yield the best results. You should notice how much heavier the pellets are after the soaking. Follow the video below for an example of the proper preparation. 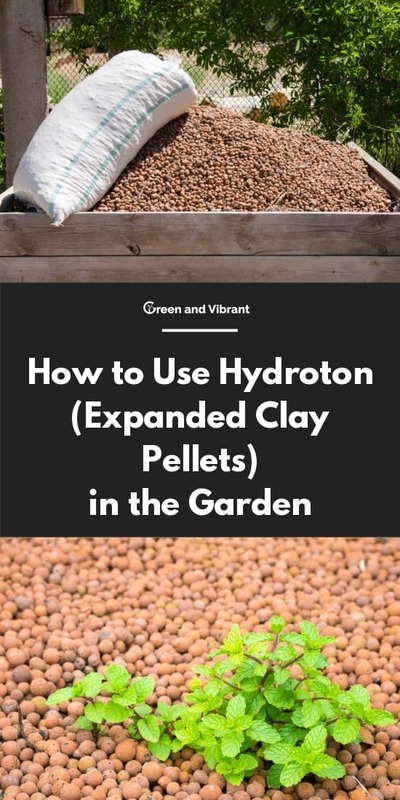 Just like planting with soil, there are many different uses of hydroton that you can try out. The process you choose will entirely depend on your plants and the growth phase. You can crush the expanded clay pellets into smaller pieces. By choosing to break down the original size, you create a texture that holds onto more water, which is perfect for seeds that you want to germinate. You can use any disposable bag to contain the expanded clay pellets, using a hammer or mallet to break the pieces down. Use the smaller pieces just like you would use potty soil for the seeds until they sprout their first leaves. However, make sure to keep the pieces large enough to stay in the pots. Let's give an example when you germinate using the mister automated by a timer. First, put the soaked pellets in small, starter pots, like what you would normally do when you grow seedlings in soil. Then, put your seeds on top of the pellets, covering it with a couple of loose pebbles for stabilization. Once prepared, nourish these plans within a humidity dome. When using a mister, make sure that the pump works with a cycle timer that lasts for no more than ten seconds at a time, repeating the process every two to three hours. If you don’t have that equipment, you can manually perform the misting. Just don’t let the water dry out before you plant the seedlings. Though hydroton grow rocks are lightweight, they are strong enough to support plants' position, especially cutting. They are also sterilized, making them a great material when cloning cuttings. Cloning Cutting using hydroton can be applied to either a low-transplant technique or a top-drip method of germination. With the low transplant technique, plant the seed low in the small pot, offering the sufficient moisture above the plant. To do this, fill up the pot about one-third of the way, and then plant the seed about 1 - 1.5" below the top layer. This not only moistens the bottom of the cutting with the nutrient solution below but also keeps the pellets partly submerged in water. The moistens bottom part of the pellets will help wick the moisture and nutrients to the clone above the water. If you use the top-drip method, you actually plant the seed where it will remain for the duration of its growth, rather than just during the germination stage. This is particularly helpful if you don’t want to spend the time and money to get extra pots, or if you are a beginner with gardening. Put your drip system as close as possible to the new cuttings to grow your “clone”. This is to keep expanded clay pellets fully soaked, providing enough moisture for the clone. Media Bed Systems and Dutch Bucket. 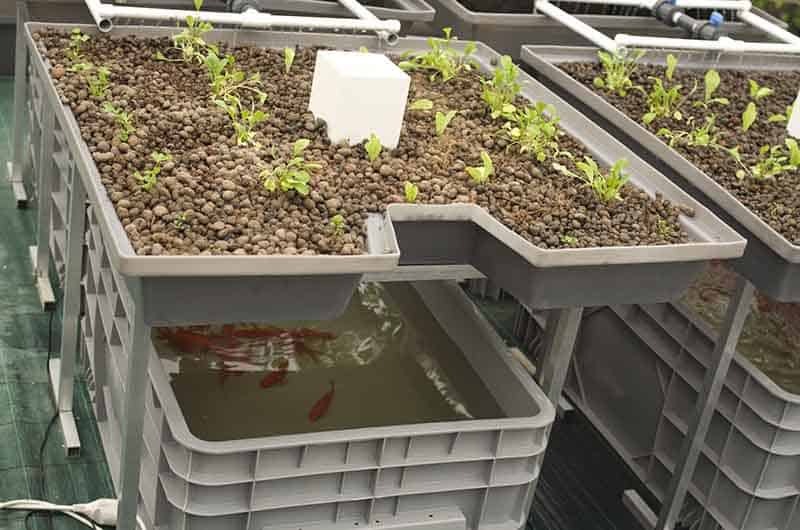 Hydroton also makes great use in media bed systems and the water-strong system, like the Dutch bucket. These types of system usually have a strong continuous flow of water. This makes hydroton a perfect medium choice as it is hard to be washed away, and can drain water well. Growers usually use only Hydroton as the main growing media or mix with your materials like Perlite, vermiculite with Hydroton at the bottom of the mixture to improve the drainage of the mixture. Don't let these pebbles get totally dried out. It takes many hours for hydroton to get totally soaked. And when dry, it can absorb the moisture from your plants, which threatens your plants' life. Get sterilized when reusing. Many hydroponic growers reuse hydroton for growing seedlings and cloning. These are very sensitive to bacteria, fungus, etc. You must make sure to soak these pebbles, sterilize it with peroxide or isotopic alcohol. Don't use hydroton alone to replace soils. Unless having a regular water irrigation system, don't grow plants in pots alone with hydroton. Hydroton cannot retain water as long as soil and will dry out very quickly without being provided with consistent water. To make sure the clay pellets continue to nourish and grow your plants, you need to take the time to rinse them and prevent the CEC value from spiking. CEC means “cation exchange capacity,” and the value is simply an indication of how much the expanded clay pellets hold onto. Because the pellets are extremely porous, they can hold the nutrients for much longer than it is effective, so you should either limit their use to a small duration of time, of you need to take the time to rinse them periodically. A good sign that it’s been left too long is the salt residue that forms on the top layer. 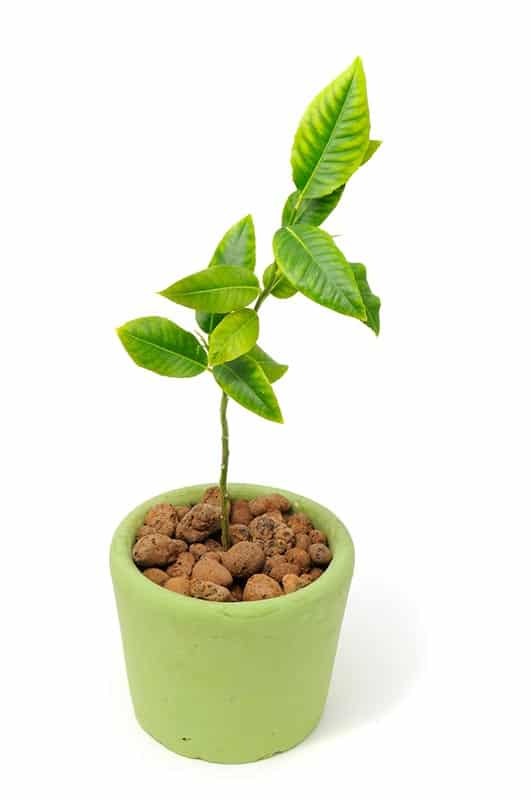 With potted plants, pull the plant out of the expanded clay pellets, and rinse the pellets from the top. If there are no pots, just flush the garden from the top as the buildup rinses away. While rinsing, exclusively use fresh water with a balanced pH. 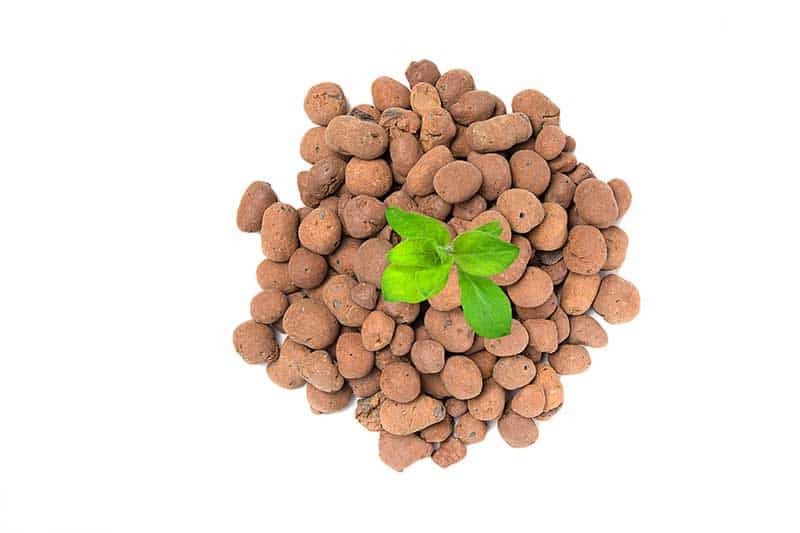 Expanded clay pellets give a level of nourishment that soil can’t keep over time, but they seem to be best for developing seedlings or for potted plants. However, with the right maintenance, you can use it in just about every growing situation. What do you think of hydroton? What’s your favorite plant to grow them with? Let us know in the comments, and share this article, if you like what you’ve learned! If you mention PPM, which measures Total Dissolved Solids, I think 8ppm is okay. Even the distilled, and RO water are hard to have the ideal 0 ppm. You can learn more about water used in hydroponics here.